Victory in the Louis Vuitton Challenger Series sees more significant silverware heading for the Emirates Team New Zealand trophy cabinet, and the win has also earned the team some significant cash. 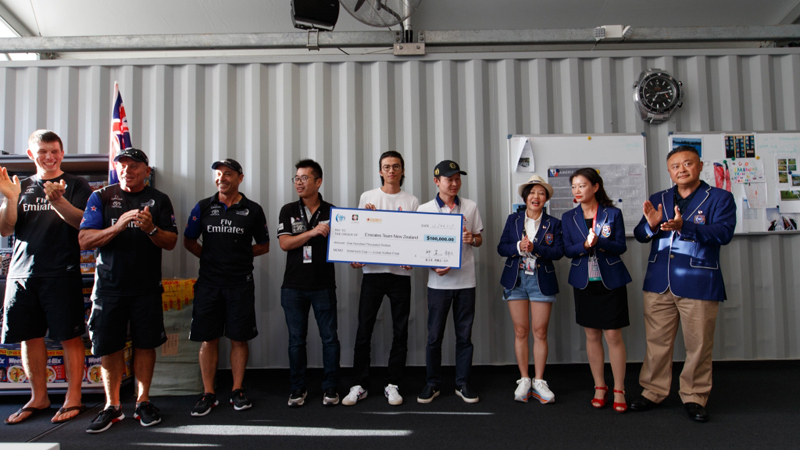 For beating Artemis 5-2 to earn a place in the America’s Cup Match, Emirates Team New Zealand received a cheque for US$100,000 from the sponsors of the China Cup International Regatta, with whom the team is in partnership. 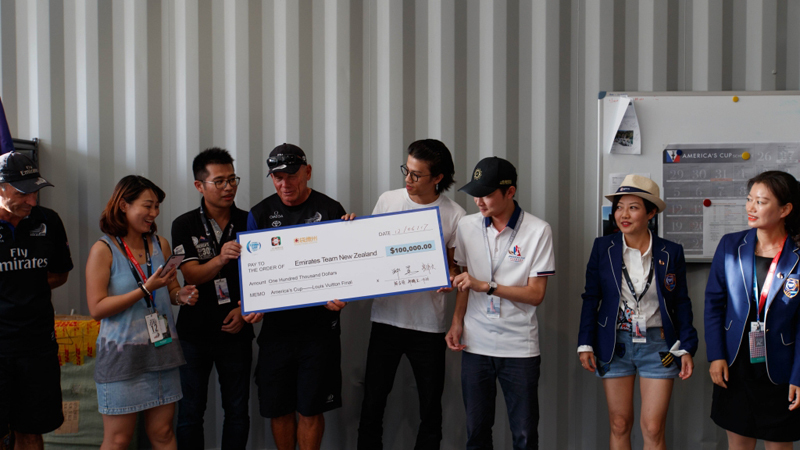 The cheque was presented at a team meeting in the Emirates Team New Zealand base with managing director Grant Dalton welcoming the much-needed contribution to the Kiwi team’s coffers. He also received a jade dragon from China Cup chief executive David Zhong as a blessing and good luck token ahead of the America’s Cup Match. And should Emirates Team New Zealand be successful, the China Cup and its partners – Yiihua Technology and Pocket Tech – will significantly increase the prize money. Co-operation between New Zealand and the China Cup has been on-going for many years and since 2015 Emirates Team New Zealand has supported crews from the Royal New Zealand Yacht Squadron at the China Cup. In 2016 the 10th China Cup drew 138 teams and 1500 sailors from 38 countries with the next edition due to be sailed in Hong Kong and Shenzhen in October. The China Cup’s mission is to develop sailing in China at every level through co-operation in sponsorship, exchange programmes, technical development and investment in the yachting industry. « Column: How Will Independents Fare In Election?